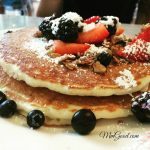 Recently I attended an event promoted by Yelp (come follow me on Yelp, I’d love that! 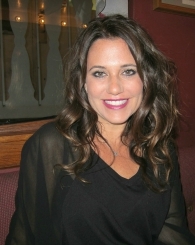 ), we went to Ruth’s Chris in Woodland Hills. At the event they served us food and drinks as it was a good opportunity for the restaurant to get new reviews based on the food/service. 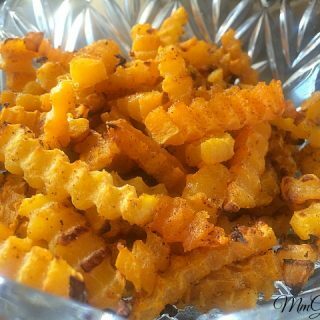 Being a “foodie”, I always pay attention to how the food is prepared, to find inspiration at home. 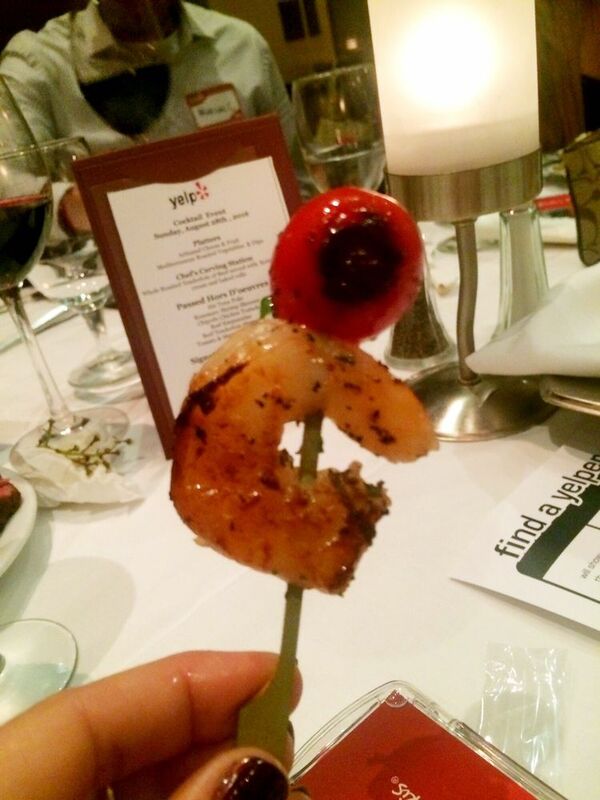 When they served the rosemary shrimp on a skewer, I knew I had found my inspiration. 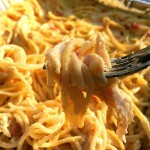 The “count” does matter in a recipe so pay attention to what you are buying vs what any recipe calls for. What the count means is approximately how many shrimp you get in a pound so for example a recipe that calls for 1 pound 8/10 count, means you will get 8-10 shrimp per pound. When making my recipe, I used the 13/15 count or a medium shrimp, if you decide to use a larger shrimp, know that you will need to adjust the cooking times. 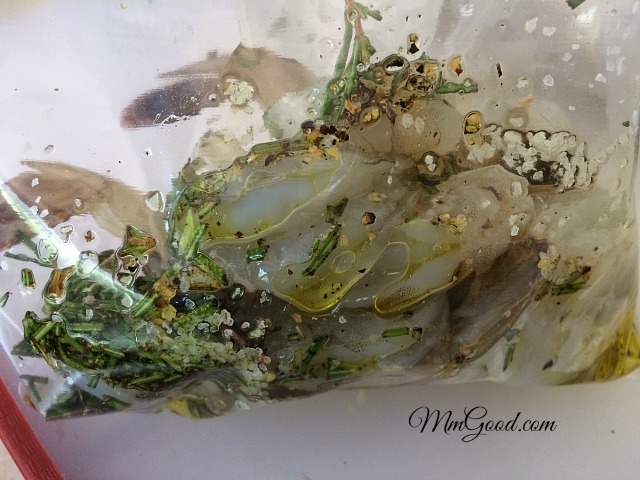 Put shrimp, rosemary, garlic, oil, salt and pepper in a bag and let it marinate for 2-4 hours, I would not let this marinade over night. see how pretty it looks with the stems of the rosemary? 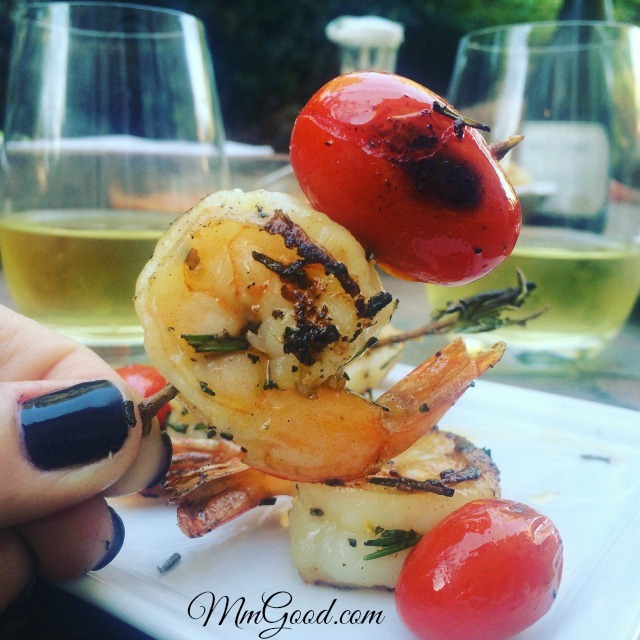 here is my cooked shrimp…not too shabby! 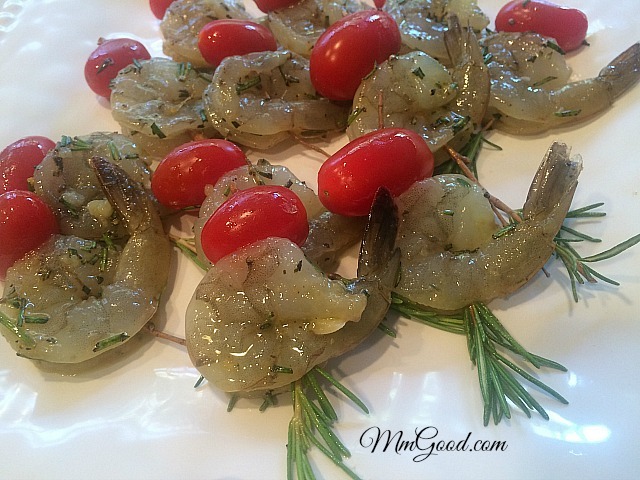 Everyone loved this recipe, it was so simple to prepare, the combination of rosemary, shrimp and garlic, let’s face it, how can you go wrong! 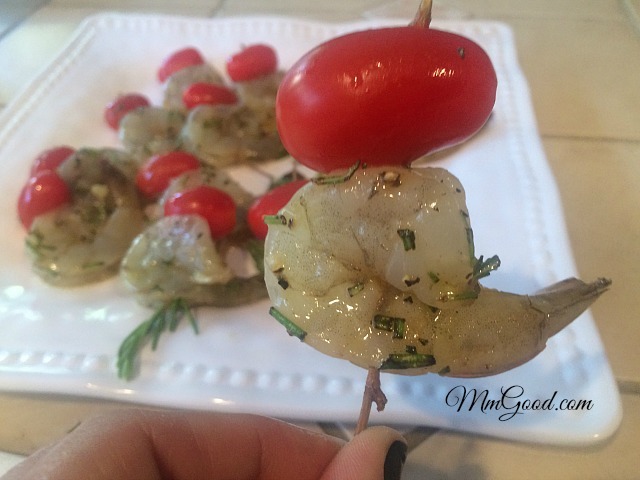 Because I didn’t have skewers, I used the stems from the rosemary, you can omit the tomato and make just the marinated shrimp and pan fry it or you can bbq the shrimp on skewers. 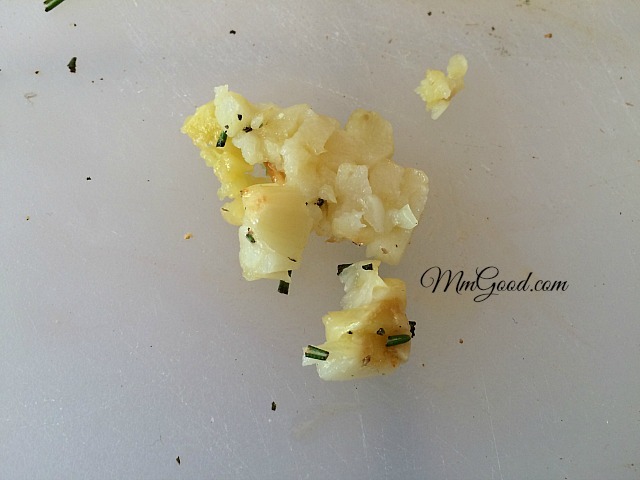 This is a great recipe that can be eaten as an appetizer or main meal! 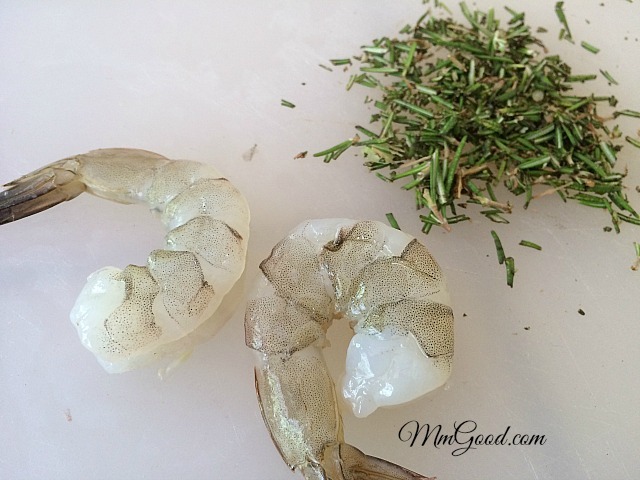 Place peeled shrimp, rosemary, garlic, olive oil, salt and pepper in a bag and let shrimp marinate for 2-4 hours. 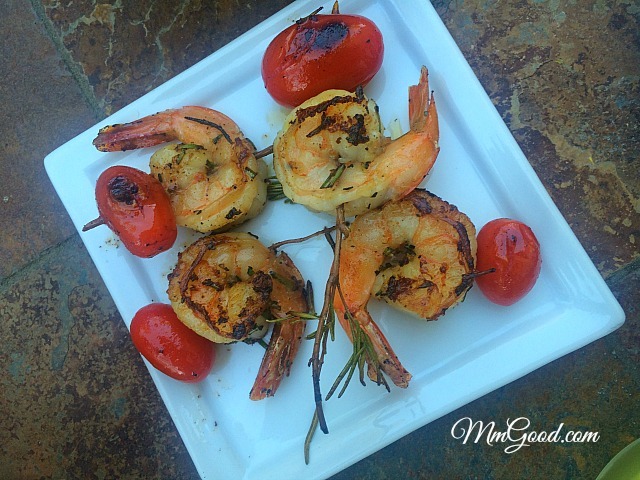 Remove shrimp from bag and skewer, topping with the tomato. 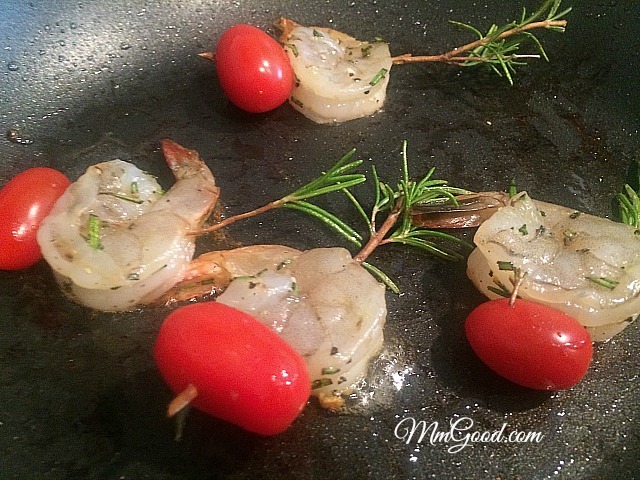 In a frying pan, saute the skewered shrimp/tomato and for 3-5 minutes per side. Remove and enjoy!